Digital marketers of the world, if we all had the budget, time, and staffing resources that we wished we had, then we’d be unstoppable. But, working in a non-profit often means having to market on a shoestring. That’s why it’s important to be strategic and prioritize high-impact, low-effort campaigns. Email is a great place to begin. On average it has one of, if not the largest conversion funnels and is often one of the cheapest ways organizations can communicate with their patrons. Thanks to new-ish technology, automation is relatively standard for most email providers and is key to ensuring that your campaigns are scalable. At Spektrix we have the privilege of working with 400+ arts organizations, and this gives us insight into how they perform on average when it comes to many areas, including email campaigns. Read on for some of the most impactful campaigns that we’ve seen cultural organizations implement with limited resources. 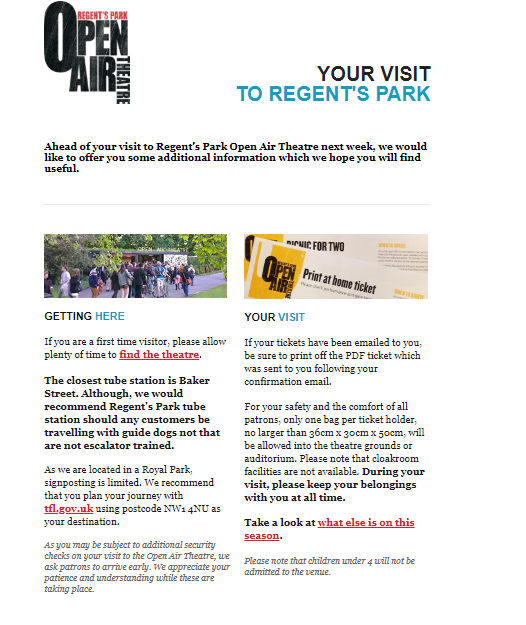 Encourage patrons to buy additional shows and take advantage of multi-buy season offers. 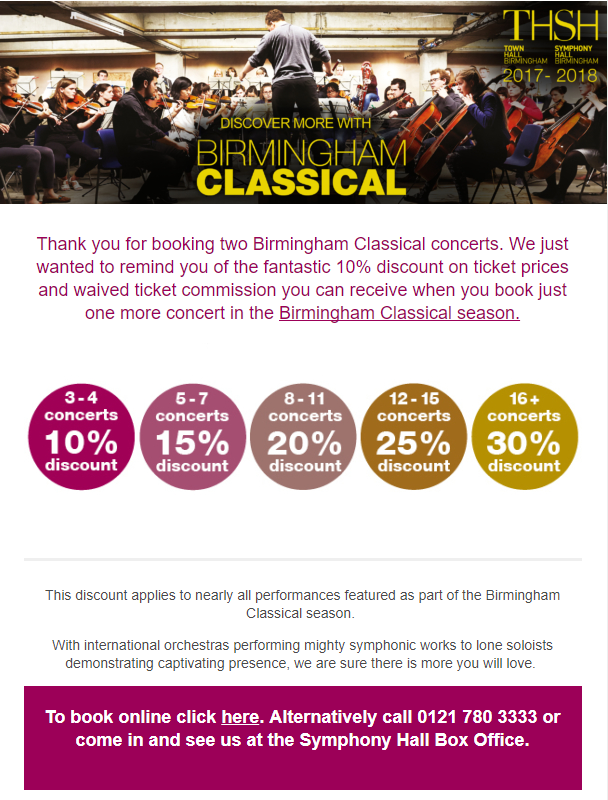 For example, Town Hall Symphony Hall (THSH) has tiered offers that give customers access to discounts after they have purchased 3+ events in the season. THSH encourages this in their purchase path when customers buy single tickets, but they also trigger a specific automated email ask after the customer has seen their second show. This timing is intentional - it occurs post-show when the customer is most excited about having been to the venue and is most open to seeing something similar to recapture the feeling they had when seeing the show. To make sure the message isn’t missed, they also have follow-up emails timed in relation to when the first was received. Best of all, if a customer opts-in to the offer and buys more tickets, they are automatically suppressed from the campaign. We’ve seen great success when emails are targeted to frequent attendees who could potentially save money by converting to members/subscribers. Cadogan Hall has done this and enjoyed a 56% uptake in new members. Customer retention is critically important to the health of an organization, and getting customers to come back more than once is 7-10 times cheaper than acquiring new customers. To that end, it’s vital that we make sure we have messaging in place that celebrates first timers and encourages them to behave the same way again. Segmenting messaging for first-time ticket buyers with logistical information is a great way to make someone feel taken care. You can include information like, how to pick up tickets, where to park, best places to eat out in the area and how to get in touch if they have questions. Likewise, doing the same for first-time members or subscribers to explain all of their benefits, how they can take advantage of perks, and justifying their purchase by emphasizing their savings or access is a great way to make sure they don’t fall prey to buyer’s remorse. It will also make it easier to renew the purchase the following year. Targeting donors with triggered messages after they donate to let them know how their gift will be used and the similar impact gifts have had so far to your organization’s mission is another excellent way to make a patron feel bought-in and make your next ask to them easier. Celebrating ‘firsts’ is a good way to keep someone going forward, but how about customers who have already come and might be at risk of not returning? Generally speaking, it’s safe to say a customer is ‘lapsed’ once 12-18 months have passed and they haven’t interacted with your organization. This means they might have received multiple emails, mailings, phone calls, etc. and just haven’t been moved to act. Once those customers become lapsed, it will be exponentially more difficult and more expensive to get them back through the door, so consider making an automated last attempt to bring them back into the fold like the MAC in Belfast does. 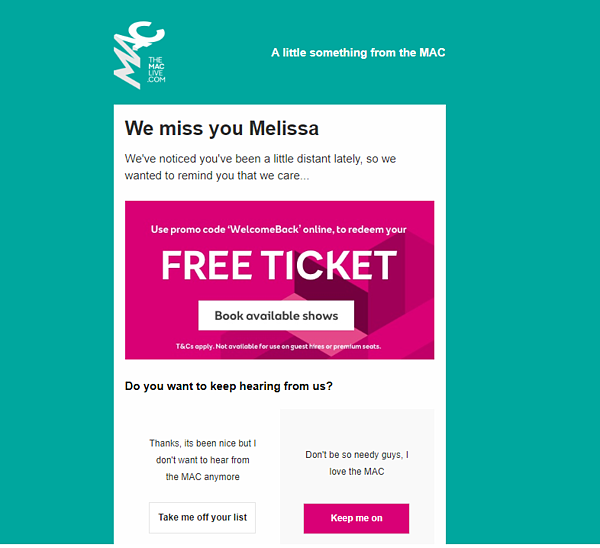 The MAC has a drip campaign set to trigger right before they would consider a customer ‘lapsed’ that incentivizes a free visit back to one of their events. The email also provides the option of allowing the customer to opt-in to staying in touch or opt out of future communications. Essentially this opt-in is another way for the customer to acknowledge their entry into the MAC’s permission-based marketing campaigns, which allows The MAC to send targeted messages to individuals who are highly engaged. There are plenty more campaigns you could create, and the above should get you started, but here’s a few more to try on for size if you’re ready. Customer anniversary content that looks back at the relationship the customer has had with your organization during certain milestones (1 year, 5+ years, etc.). Find that balance. 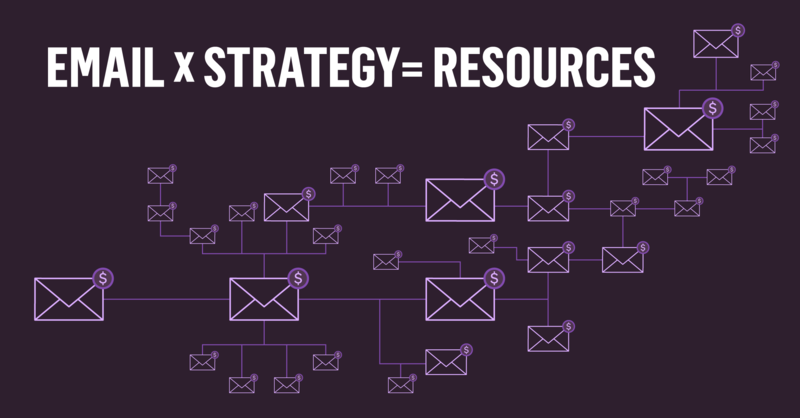 Keep the campaign content and messaging scalable to your resources. Targeting is always a best practice, but make sure not to divide your audiences so much so that it becomes difficult to manage the efforts with your current staffing. Be dynamic. Don’t be afraid to update the messaging on a regular basis. Maybe it’s once or twice a year, or every quarter. Define the goal and measure it. Whether it’s reducing customer churn, increasing average order value, or reducing the number of customer questions to the box office call center, make sure you clearly define campaign goals. This will help you optimize and analyze once it's implemented. David Ciano is an Account Executive at Spektrix. Spektrix delivers intuitive ticketing, marketing, and fundraising tools with the mission to advance the arts through technology. Spektrix is a proud sponsor of Digital Marketing Boot Camp for the Arts 2018.